Anonym (1895). Memorial record of the counties of Faribault, Martin, Watonwan and Jackson, Minnesota. Lewis publishing Co, Chicago, 766 p.
Baltzinger Laffont P. (2008). Ardèche Dauphiné Alsace - Je voulais vous dire... 249 p. (2e éd. 2009 - CDrom). Baecher R. (2004). Entre légende et réalité : les Peterschmitt. Souvenance anabaptiste, 23, 14-39. Becker J. A. (1997). Sherk : a genealogy of one line of the Sherk family tracing their lives in Switzerland, Pennsylvania, Humberstone Township in Welland Co., Upper Canada and South Dorchester Township, Elgin County, Ontario : including Hans Schurch of Sumiswald, Switzerland, born c.1560. ISBN 0-919387-36-5, 36 p.
Beers J. H. & Co (1896). Commemorative biographical record of the counties of Sandusky and Ottawa, Ohio. Editeur Beers J.H. & Co, 854 p.
Blanchard Rufus (1882). History of Du Page County, Illinois. 541 p.
Chapman Publ. Co (1899). Nadelhoffer William. In: Portrait and biographical record of Leavenworth, Douglas and Franklin counties, Kansas. Containing portraits, biographies and genealogies of well known citizens of the past and present. Chapman, Chicago, p. 772-773, 845 p.
Devereux G. H. (1871). Sam Shirk: A tale of the woods of Maine. Hurd & Houghton, New-York, 391 p.
Eby E. E. (1895). A biographical history of Waterloo township and other townships of the county : being a history of the early settlers and their descendants, mostly all of Pennsylvania Dutch origin : as also much other unpublished historical information chiefly of a local character. Berlin, Ont. [Kitchener], vol. 1, 887 p.
Eby E. E. (1896). A biographical history of Waterloo township and other..., vol. 2, 712 p.
Emig A. (1951). Rapport du Principal du Collège Moderne et Technique. Réunion du bureau d'Administration le 26 mai 1951, 9 p.
Emig C. C. (2012). Alsace entre guerres et paix. In : Faire la guerre, faire la paix : approches sémantiques et ambiguïtés terminologiques. Actes des Congrès des Sociétés historiques et scientifiques, Éd. Comité des Travaux Historiques et Scientifiques, Paris, p. 195-207. Emig C. C. (2018). Descendants d'Anna Schürch en Franche-Comté et en Alsace. Nouveaux eCrits Scientifiques, 01-2018, 48 p. - 2e édition. Emig C. C. (2013). Courte et incomplète biographie du bagnard Jean Brauer de Riquewihr. Bulletin du Cercle généalogique d'Alsace, 182, 88-91. Guinn J. M. (1905). History of the State of California and biographical record of the San Joaquin Valley, California. An historical story of the State's marvelous growth from its earliest settlement to the present time. The Chapman Publishing Co., Chicago, 1643 p.
Houser J. K. (2006). Change of Venue: Interconnections and Divergences among Schürchs of Central Pennsylvania. Lecture Notes for Talk Given at Schürch Family Reunion, August 4, 2006, 10 p.
Imer Bernard (2013). Histoire et généalogie de la famille de Christian EMIG et de ses alliances. 60 p.
Kleindienst J. L. (1992). Les familles Geyl. Association des amis du vieux Zellenberg, 19 p.
Kleindienst J. L. (1994). Les familles Hinn. Association des amis du vieux Zellenberg, 18 p.
Mayer-Schaller E. & Imer B. (2013). Histoire et généalogie de la famille GREINER. 236 p.
Mochel Moler L. (1984). History of Mochel's hardware 1884 - 1984. 9 p. (May, 1984). M. S. (auteur inconnu). Les Sturm de Betschdorf. 3 p.
Nadelhoffer M. . Family History - Nadelhoffer - Stauch Families 1856 - 2003. 337 p.
Neill E. D. (1882). History of Freeborn County, Including explorers and pioneers of Minnesota and outline history of the State of Minnesota. Historical Company, Minneapolis, 548 p.
Peterschmitt E. & H. Nafziger (1991). Les Peterschmitt. Souvenance anabaptiste, 10, 20-37. Rommel G. (-). Die Familie Roser in Kleinsteinbach. 4 p.
Schürch R. (1996). Schürch von Sumiswald. Publié par René Schürch, Bremgarten (Berne), Vol. 2 (Elsass/Alsace), 220 p.
Schürch L. (1998). Familiengeschichte Schürch von der Sumiswal BE. Schürch-Geschichten - in : Mitteilungsblatt der Schweizerische Gesellschaft der Namenträger Schürch, 35, p. 1508-1547. Sherk A. (1982). The Sherk family. Gateway Press, Baltimore, USA, 357 p.
Sherk J. H., Vermillion S. D. & Associates (199x). Sherk record book. Family History Library, Salt Lake City, USA, 38 p.
Sherk T. A. & J. W. Sherrick (1990). Joseph Scherch, immigrant of 1727, and his Descendants. Lancaster Mennonite Historical Society, 287 p.
Shirk H. Y. (1914). The Shirk family history and genealogy - from 1665 to 1914. Elkhardt (Indiana, USA), 150 p.
Shirk W. D. (1918). History and genealogy of the Thomas J. and Henrietta (Howells) Powell families. Ledger Printing House, Fairfield (Iowa, USA), 280 p. - voir p. 159 et suivants. Sidener O. W. (1962?). The story of a dozen generations. Part 3, 344 p.
Starke C.A. (Firm) (1972). Deutsches Geschlechterbuch, Volume 161, p. 432. Stiner I. H. (1934). History of Porterville. 625 p.
Stiner I. H. (1991). Porterville, California, genealogies: Tulare County, California. 471 p.
Sturm J.-J. (2007). Ostheim [des origines - après la Libération 23 janvier 1945]. 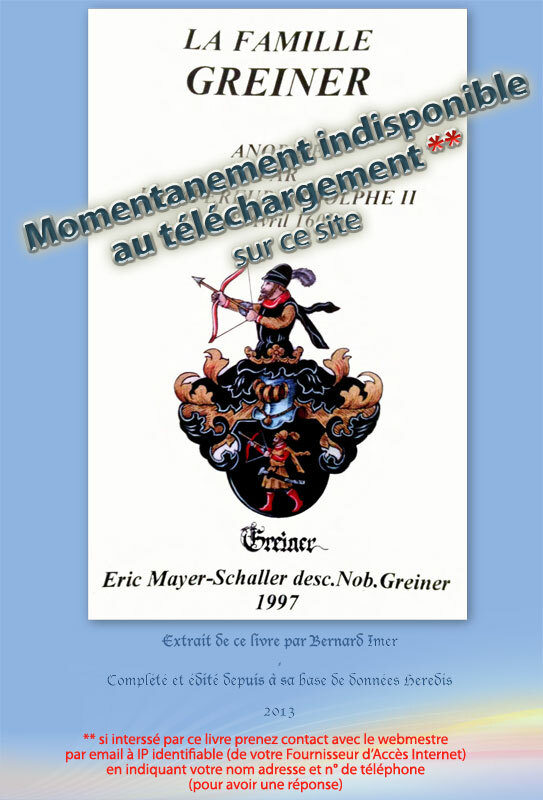 407 p. - Recherches historiques sur Ostheim (1995) par J.-J.-Sturm. Extrait - (1862). In: Transactions of the California State Agricultural Society during the year 1861 (Published by State of California, 1862). Viel G. (2013). Les deux vies de Paul Frédéric SCHOTT. 2e éd., 30 p.
Viel G. (2013). The two lives of Paul Frédéric SCHOTT. Edition in English, 29 p.
Wittner H. R. (2002). Die Mannrechtsrodel von Bern. http://swiss.genealogy.net/ kant/bemare-d.pdf, 38 p.
Wohlhueter B. J. (1998). Our Wohlhueter family : after and before Frederick William Wohlhueter and Kathryn Rebecca Roser. Edité à compte d'auteur, Brandenton, Floride, 60 p.
Wohlhüter Margaretha épouse Binder (2011). Histoire de la branche Wohlhüter qui a émigré en Batscha (Serbie), 2011. http://www.bulkes.de/ [extraits]. 70 p.
Würtz T. (1990). L'immigration suisse à Mittelwihr (68) 1550 - 1750. 21 p.
Würtz T. (1990). Schweizerische Einwanderung in Mittelwihr (68 Dep. Haut Rhin) 1550 - 1750. 21 p.
Würtz Theo. (2000). Nos cousins d'Amérique (III). Bulletin du Cercle Généalogique d'Alsace, n° 130, p. 695-702.